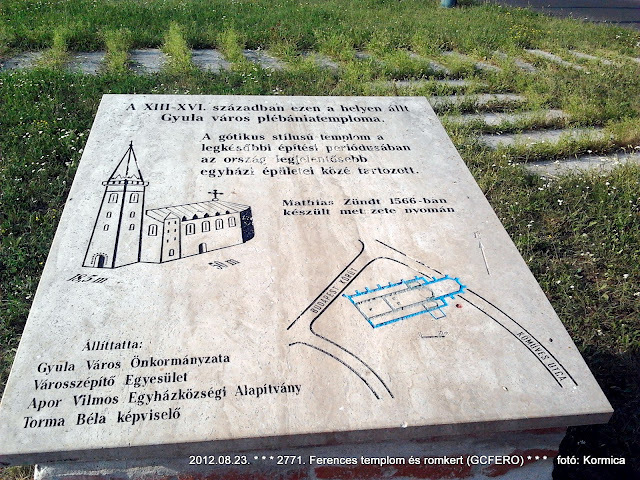 Time Travel to Gyula – Reconstructed Franciscan Ruin. It is expected that the Franciscan ruin of Gyula will be handed over under with the Roman Catholic Mass, after consultation with the Church, is expected in October. Last year, Mayor Ernő Görgényi initiated the possibility that in the 2017 budget, the city should provide this source of money. The historical site is definitely to be a more promising tourist destination than ever before. The Franciscan monks established in 1410 by the pope in the estate of Gyula, once 35 meters in length and 10 meters wide. The Franciscan Garden – Church and Monastery in 1905, was requested by János Maróti major of Macsó the permission from the pope to set up the Franciscan monastery. Most of the population lived in this area until 1566., when most fled from the attacks of the Turks. According to historians and archaeologists at the first half of the 20th century in the Franciscan Garden at the Epreskert Street, two Hungarian ladies were buried in the 16th century, Erzsébet Corvin and Beatrix Frangepán. Both remnants were discovered in the 1930s. The shrine and the built-in cells were reconstructed in the 1960s and some of them are still visible today. There is no doubt that very few people know at Gyula and its surroundings that the Gyula Franciscan monastery and the church were extremely unique and great at the time. In terms of its function, it also played a prominent role since three provincial meetings were held here. During the Reformation, it was important for the Catholics to have the region, a dominant and strong Catholic institution.